I'm back from foreign parts! My wife and I both paid the utterly exorbitant fare to get from the Airport to Central because, frankly, it's cheaper and easier than the alternative. Parking at Sydney Airport costs so much you feel a compulsion to check that they got the decimal point in the right spot. A cab to our place (or, realistically, even to central station) was still far more expensive, and likely would involve far longer queues. At the end of the day, the Airport Line is the obvious option, And, on the rare occasion I get to fly anywhere, it's the option I almost invariably use. The high fares date back to the opening of the Airport Line. The Labor government's enthusiasm for building infrastructure without having to pay for it gave us toll-roads all over the city - but how were they going to get a rail-line built in the same way? Simple - charge an eye-wateringly high fee to use only those new stations. It creates an absurd situation and further complicates an already convoluted fare system, but I suppose that's hardly a priority. From a purely commercial point of view, it makes sense. Millions of commuters (including myself) still find the airport line to be "good value" in the sense that it is cheaper and easier than the alternative - so why not? Well, the answer should be obvious - governments have, as part of their role, the provision of public infrastructure. Building lines like the Airport Line are why we pay taxes. Sydney is lucky enough (or unlucky enough, if you live under a flight path) to have an airport within a short train trip of the city. That it took as long as it did to build a train line is more than a little ridiculous. Many people complain what an awful greeting the enormous fees are to an international traveller - what the complainers don't realise is that the typical traveller would happily drop $30 to get to their hotel from the airport. That's a pretty small number compared to many cities in Australia and internationally. My gripe, however, is that "People will pay it" is not a good argument to charge people for something that falls well with the ambit of governmental responsibility. Last weekend, as I left London to catch a Virgin Atlantic flight home, I caught the tube to Heathrow Airport. It cost me a little over 3 quid. Of course, I also got to use the outstanding Oyster Card system, but that's another discussion. 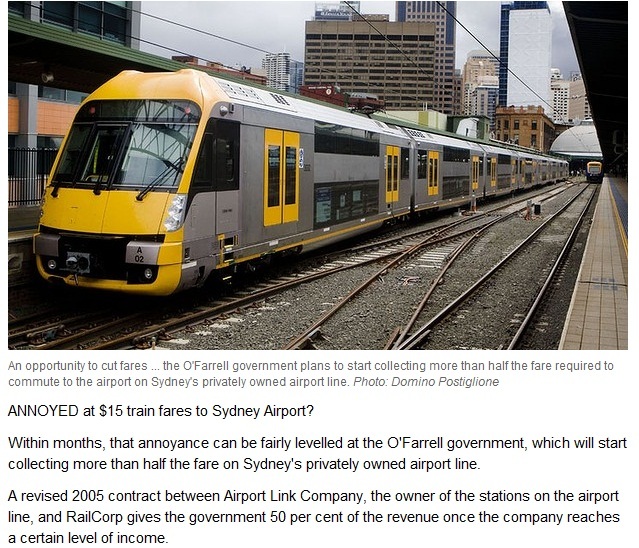 People will pay more to use the Airport Line. But that doesn't mean that they should have to pay it. Australian governments need to move away from the idea that public transport should be priced such that "user pays". When I use public transport everyone benefits - the car I don't use doesn't clog up the already over-crowded roads. Of course, the only way this problem will get fixed is if the government buys the airport line, and given the (real or imagined) budgetary constraints, that hardly seems likely. So, on we go, no doubt to the relief of the owners of the airport and taxi plates across the city. I have been known to get off one station early for domestic flights and walk from Mascot to the airport to save myself over $10 (usually times two people, times two for return trip)... I can think of other things I'd rather spend $40 on than an extra stop on the train. It's only a 10 minute walk, and as long as it's not raining, very late at night, or I have lots of luggage it's quite an easy and pleasant walk. if 3 of you are traveling it's cheaper to get a cab, but 2 or 1 and train is the go.